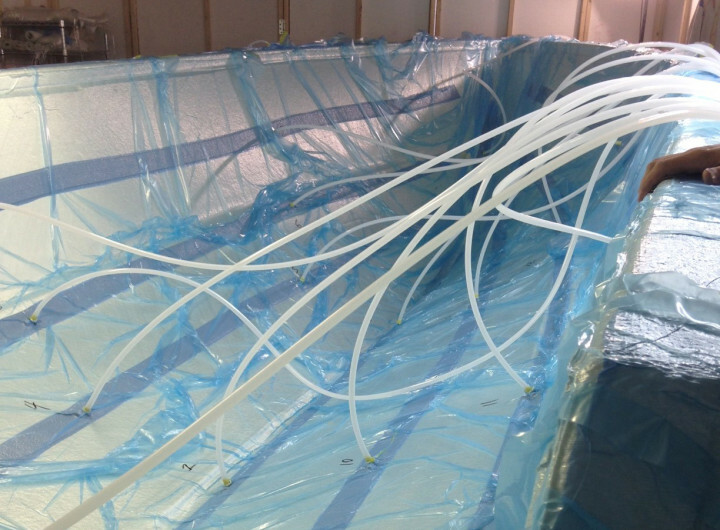 We are proud to announce that today, February 25, 2014, we resin infused our first Stuart Boatworks hull! Our hand laid hull lamination schedule that has been the basis of all of our hulls to date was designed intentionally to be 20% heavier and stronger than even the strongest of industry standards for boats of our size and the proof of their strength is being experienced from New England to the Virgin Islands in the roughest of conditions. However, today we stepped up our approach to building the very best boat in our class by resin infusing our hull. We have chosen to infuse our hulls for all of the same reasons with the exception of one of the objectives. We desired to maintain the original weight of our hulls or possibly even increase the weight of our hulls over the heavy hand lamination schedule that they were originally built to. This is somewhat counter intuitive but our boats are all about keeping the rounded shape of the bottom surfaces IN THE WATER as much as possible as opposed to most other builders wanting their boats to be ON TOP OF THE WATER. For us, the more weight, the better we will achieve this goal. As a result, our hulls now become 6 times stronger, per naval architects’ stringent testing standards, than our original “over-kill” hand lamination schedule. Nearly indestructible. How is this additional strength achieved? The goal of almost all hand laminated boat manufacturers is to have a boat built with 60% resin and 40% fiberglass cloth. Resin itself is not strong. It is heavy and brittle. The fiberglass cloth provides the strength, in simple terms. However, often when hand laminating a mold the laminators will build a resin-rich part (or hull) because human nature is for the laminator to use more resin than is actually required to saturate the fiberglass cloth in the desire to eliminate air voids in the lamination process. The net result is a boat that is unnecessarily heavy without being stronger at all. Conversely, the Resin Infusion Process is engineered around the ratio of resin to cloth being 40% resin and 60% cloth. This makes for a considerably stronger finished part (or hull) without adding undesired extra weight that provides no additional strength. This ratio is precisely controlled and each part or hull mold is infused using the same amount of resin every time. The net result is a boat that is many times stronger and more durable than a hand laminated boat!